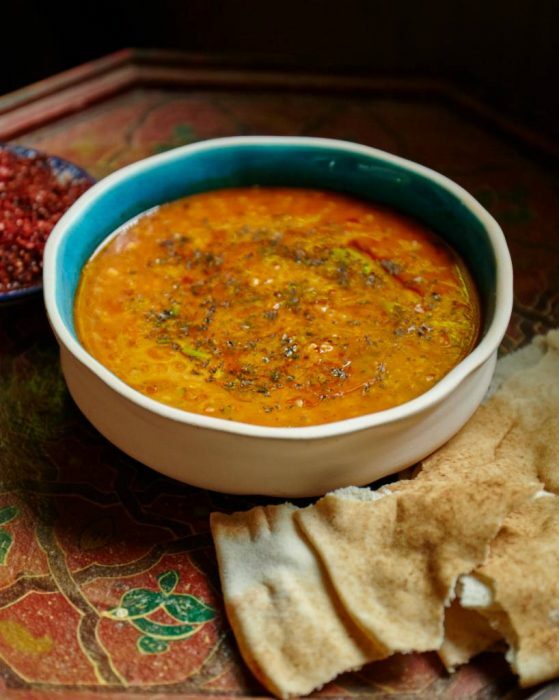 It has been a busy and very special summer, sharing Ozlem’s Turkish Table cookery book with Turkish food lovers and teaching Turkish cookery, which took me to Amman – Jordan, International Edinburgh Book Festival – Scotland and London. Making a cookery book is a labor of love and every bit of this journey has been very special; my very sincere thanks goes to Pinar UK for their invaluable support for my book and supporting Turkish cuisine abroad. 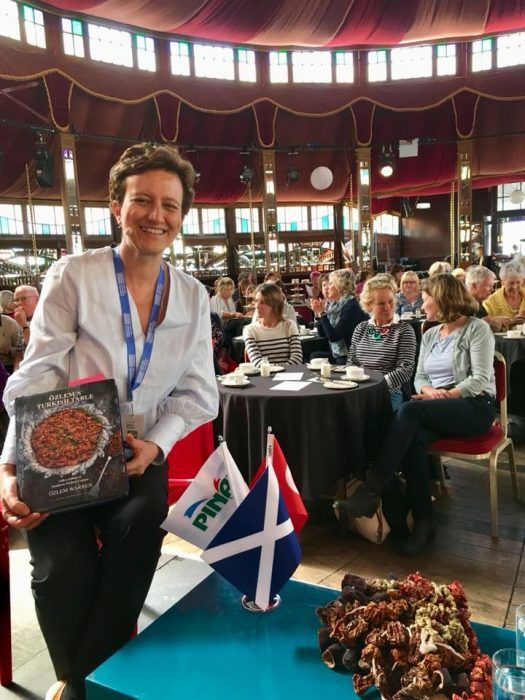 It was a real honor to be a part of the International Edinburgh Book Festival, as a featured author with my cookery book, Ozlem’s Turkish Table, Recipes from My Homeland. this year, on August 24th, 2018. 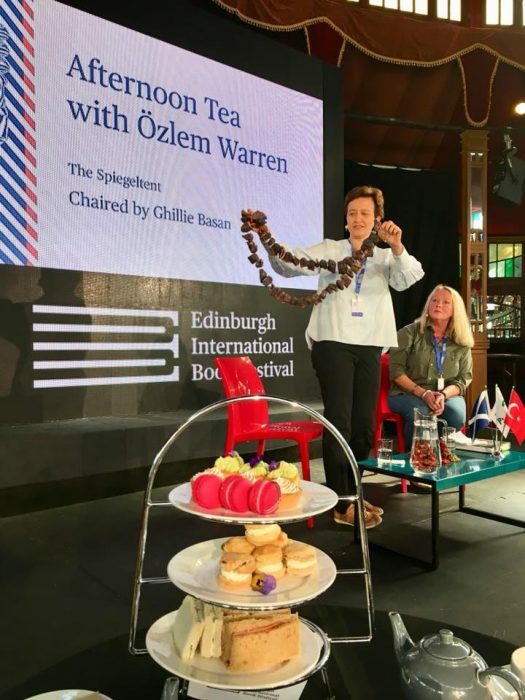 The festival hosted a wonderful event called “The Afternoon tea with Ozlem Warren”, where dear Ghillie Basan hosted an hour long interview with me ; we talked about southern Turkish cuisine, Antakya, culinary traditions and stories of from my homeland. Over 100 Turkish food lovers attended to this event, I was very humbled and delighted with everyone’s interest and kindness. We finished off with signing copies of Ozlem’s Turkish Table, Recipes from My Homeland cookery book. A very special, unforgettable event; my sincere thanks goes to the Festival, as well as dear Ghillie Basan, for all their support and warm welcome. 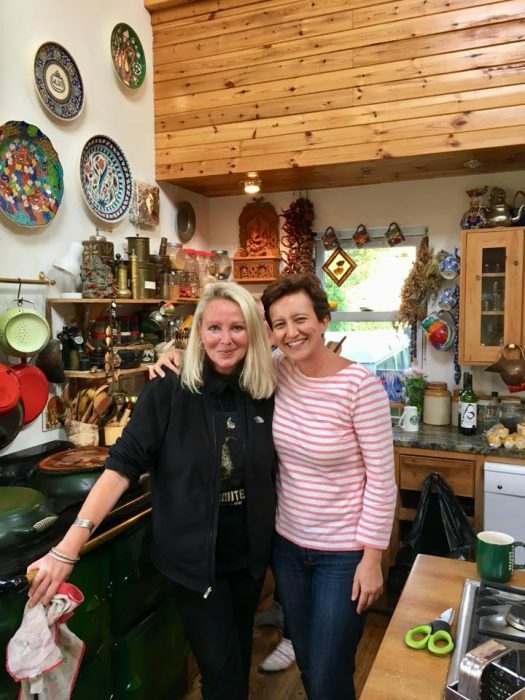 Another special part of my trip to Scotland was, a chance to visit to dear Ghillie Basan at her wonderful wilderness retreat, Cairngorms National Park, Scotland. A very special highlight as she has been a huge hero of mine with her amazing cookery book and workshops. We cooked, shared, laughed and recorded 2 wonderful podcasts on Turkish cuisine and my southern Turkish roots with Ghillie, which will be released soon, will gladly share you the links. I also had the pleasure of meeting Ghillie’s wonderful children, Zeki and Yazzie; gorgeous, caring, hardworking, happy children; a huge credit to her for raising her children so beautifully. It was a very special trip that will remain always be in my heart. It’s been a very special over 8 months of sharing my cookery book, Ozlem’s Turkish Table, with Turkish food lovers around the world. It took me 10 years to write this book, dear to my heart, and you have all been so very kind for your amazing interest and positive, heartwarming comments of enjoyment for my book, my very sincere thanks to you all. 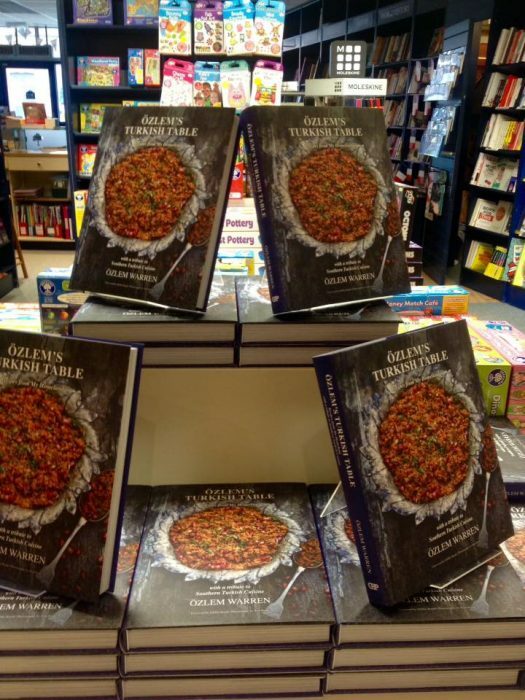 Over 1,700 copies of Ozlem’s Turkish Table sold and reached to Turkish food lovers, thank you so much! This was well beyond our expectations, my sincere thanks and gratitude for all your kindness and interest. 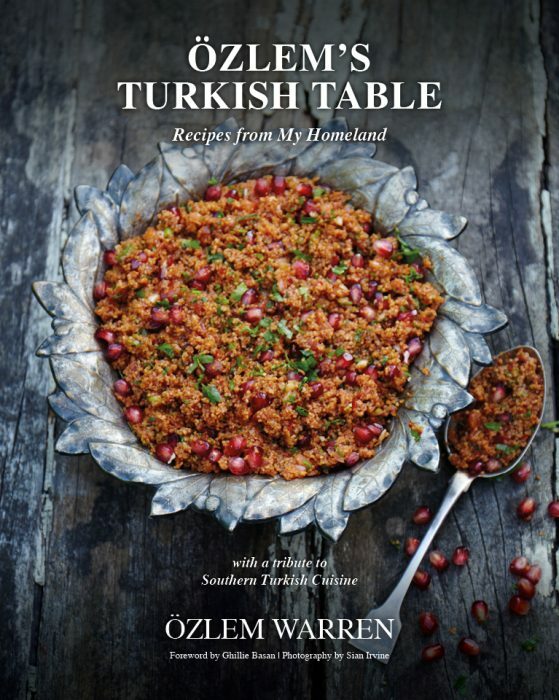 Signed copies of Ozlem’s Turkiah Table cookery book is still available (while the stocks last) at this link, if you’d like to get a copy. It is delivered worldwide, promptly. 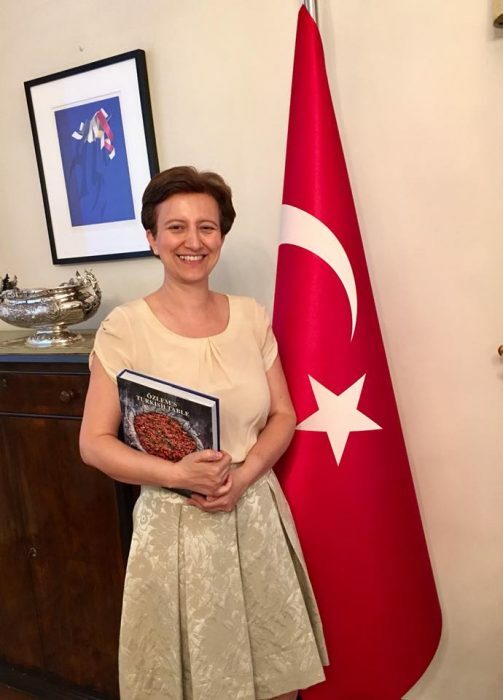 Turkish culinary expert Ozlem is born and bred in Turkey and she is passionate about her southern Turkish roots going back to the ancient Antioch, today’s Antakya. 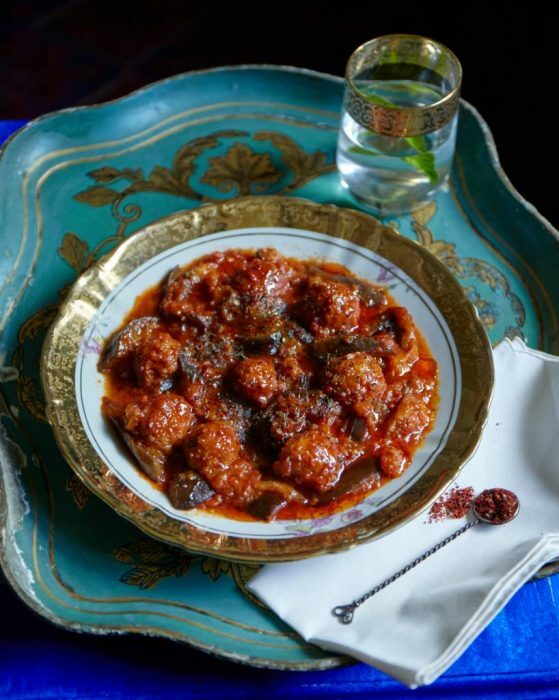 Join Ozlem to recreate an authentic Turkish autumnal feast with these scrumptious dishes from her cookery book, Ozlem’s Turkish Table, along with stories and tips of preparation. Recipes include Bulgur balls with aubergine, tomato, dried mint and pomegranate molasses (Patlicanli Eksi Asi), Flat breads with feta, za’atar, red pepper paste (Biberli Ekmek),Leafy greens with onions, peppers, pine nuts (Antakya’s Zilk Inspiration), Candied Pumpkin dessert with walnuts (Kabak Tatlisi) and Turkish coffee. 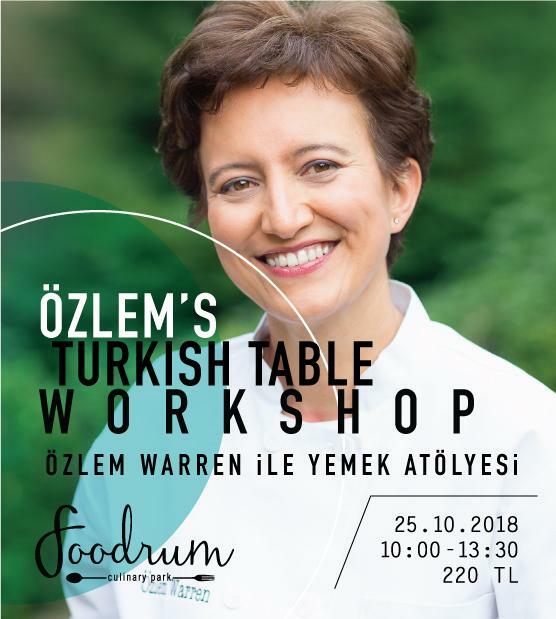 Ozlem’s Turkish Table Coming to Bodrum (October 25th and 26th, 2018)! 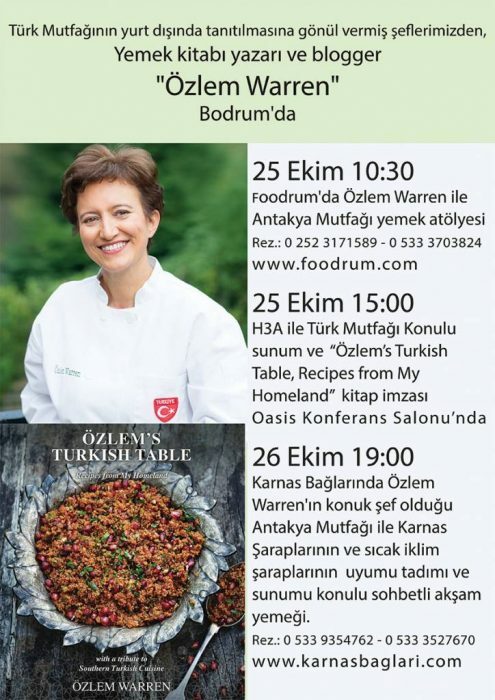 I really am so very excited to return to Bodrum, with my cookery book Ozlem’s Turkish Table, with some wonderful events on October 25th and October 26th. I love Bodrum and it will be such a pleasure to run some exciting events with wonderful groups in Bodrum. On October 25th at 3pm, I will be giving a talk on Turkish cuisine, with a focus on Southern Turkish cookery, thanks to a very kind invite by the Herodotus Academy, H3A Bodrum, at Oasis Conference Room in Bodrum. This is an open event to Turkish food lovers and all welcome. I will also sign copies of Ozlem’s Turkish Table cookery book at this event. Please kindly contact Reyhan reyhandestan@gmail.com, if you would like to join us. My sincere thanks to Herodotus Academy, H3A – Bodrum, Foodrum Culinary Park, Cooking Classes Bodrum and Karnas Vineyards for all their support for our events and having me. A very special thanks goes to dear Annie Onursan of Back to Bodrum blog for having me in Bodrum and for all her support; I am a huge fan of her and her wonderful blog, Back to Bodrum. 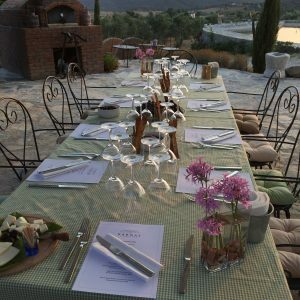 I greatly look forward to our delicious Supper Club, Antakya style and pairing the menu with wonderful local wines by Karnas Vineyard, located in Bodrum peninsula on Friday, October 26th, 7pm onwards; it will be a special night of celebrating southern Turkish cuisine and local Turkish wine by Karnas Vineyard, in their beautiful setting. We will talk about southern Turkish cuisine, wine pairing and more – I hope you can join us at this special event. Participation is limited so please kindly get in touch with asli@cookingclassesbodrum.com or call 0533 3527670 or whatsapp 05339354762 to reserve your spot. 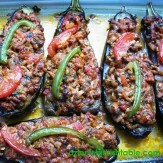 Menu includes; Flat breads with za’atar, cheese and red pepper paste (Biberli ekmek), Antakya’s savory pastry with minced meat topping (Kaytaz boregi), Baked oval bulgur balls with walnut and minced meat (Oruk), Stuffed dried aubergines with minced meat filling (Kuru Patlican dolmasi), Olive Salad with zahtar and pomegranate molasses (Antakya’nin zeytin ufeleme salatası), Muhammara (Cevizli biber), Tray bake kebab with vegetables (Tepsi Kebabi), Kadayifi (Kunefe), served with unlimited Karnas wines. Southern Turkish Delights from Ozlem’s Turkish Table at Texas! I really can’t wait to return to Central Market Cooking Schools this November! This special place is where I started my culinary journey and it is such an honor to come back, this time, with my cookery book, Ozlem’s Turkish Table. The registration for the classes starts on October 1st at Central Market Cooking School website at this link, and the classes likely to sell out quickly. So if you’d like to join us, please book your spot soon – hope to see you in Texas! 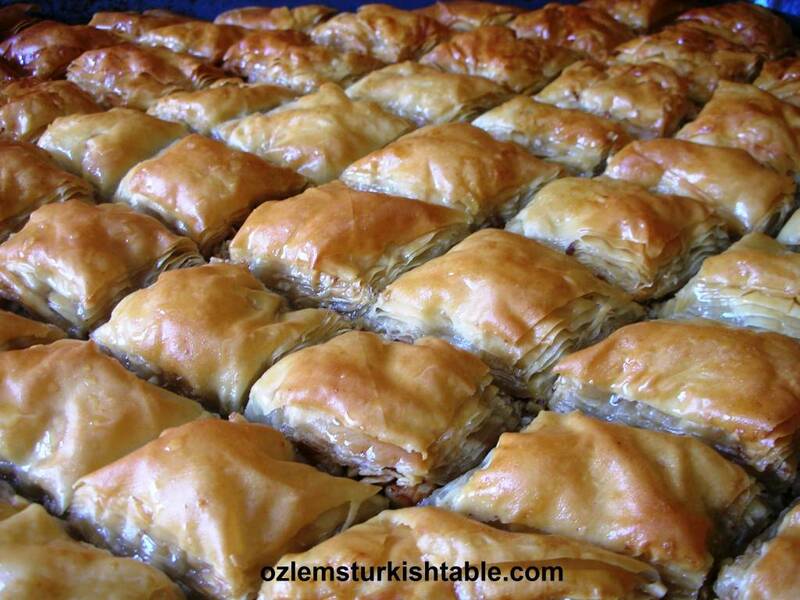 Ozlem’s Turkish Table Central Market cookery class dates are : Houston on Nov. 7th; Austin on Nov. 8th; Dallas on Nov 9th; San Antonio on Nov 10th. Booking will be open from Central Market Cooking School website as of October 1st at this link, and the classes likely to sell out quickly. So please kindly book your spot soon – I am very much looking forward to returning to Central Market and seeing you all! It is autumn / fall, and we are all getting excited about the pumpkin season. 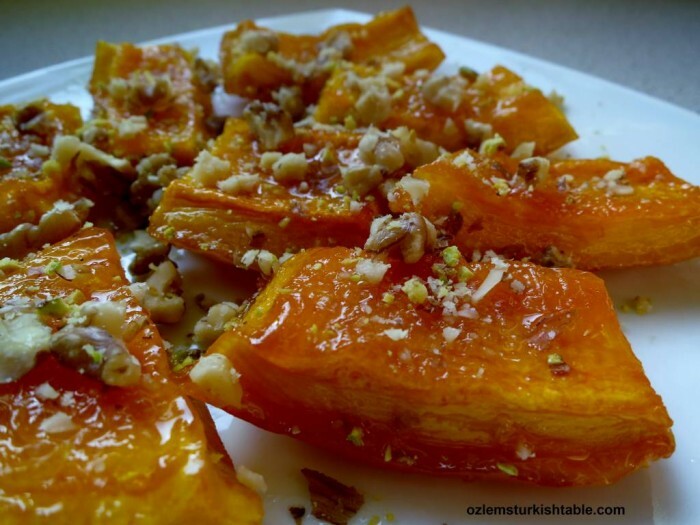 I love this Candied pumpkin dessert with walnuts, Kabak Tatlisi, Antakya style. Here, the pumpkin is baked in its own juice – it is so delightful and easy. Here’s my recipe link, if you’d like to give it a go. 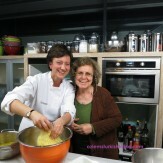 I wish you all a wonderful autumn /fall and do hope to see you at one of my cookery classes or events. 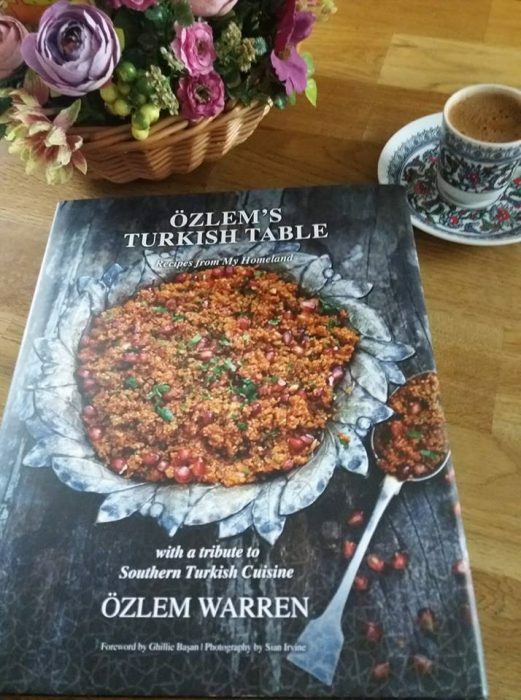 If you can’t make it to the events and would like to get a Signed copy of my cookery book, Ozlem’s Turkish Table, you can order at this link; I am told it makes a special gift. 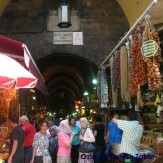 2 Responses to Ozlem’s Turkish Table to Bodrum, Texas, Divertimenti-London!